Mihai began his training as a cellist at the age of seven at the Music High School in his native city of Cluj, Romania. At the age of 18 he moved to the United States where he has earned his Master's and Artist Diploma Degrees under the guidance of renowned cellist and pedagogue Prof. Aldo Parisot at the Yale School of Music. While still in Romania Mihai won the first prize of numerous competitions, including the J.F. Dotzauer International Cello Comeptition in Dresden, Germany. While at Yale he won the First Prize and the award for the best performance of a commissioned work by Jeffrey Miller, in the 2005 Irving M. Klein International String Competition, the First Prize and the Audience Choice Award at the 2006 "Dr. Luis Sigall" International Competition in Vina del Mar, Chile, and he received the 2006 Charlotte White's Salon de Virtuosi Fellowship Grant. Mihai has performed as a soloist with orchestras such as the Louisville Orchestra, Santa Cruz Symphony (U.S.A.), Symphony Orchestra of Chile, Xalapa Symphony (Mexico), Daejeon Philharmonic Orchestra (South Korea), the Hermitage State Orchestra of St. Petersburg (Russia), and the Stuttgart Youth Orchestra (Germany). In his homeland, he has soloed extensively with the major orchestras such as, the Transilvania Philharmonic Orchestra, and the National Radio Orchestra. He has also appeared in recital performances in Austria, Hungary, Germany, Spain, Holland, South Korea, Japan, Chile, the United States and Canada. He has performed in several festivals, including the Banff Music Festival, Great Mountains Music Festival, the San Miguel de Allende Music Festival, and the Laguna Beach Chamber Music Festival, where he worked with the renowned bass player Edgar Meyer. Mihai played a Weill Hall debut recital and a Zankel Hall debut performing Tchaikovsky's Rococo Variations in early 2008. Mihai served as interim principal cellist with the New Haven Symphony Orchestra for the 2008-2009 season. Adrian Daurov, born in St.Petersburg, Russia, studied at the St.Petersburg Conservatory with Anatoly Nikitin. From the early age Adrian appeared as a soloist and chamber musician on the main concert stages of St.Petersburg, Moscow, as well as in Europe and the U.S. He made his debut with the orchestra in 1997 with the St.Petersburg Symphony Orchestra. Adrian was awarded with 1st prizes at the international music competitions in Dobrich, Bulgaria (1996), Peter De Grote, Groningen, The Netherlands (2001) and the LISMA Foundation Competition in NY (2006). In 2004 he toured Germany as a soloist with the St.Petersburg Chamber Orchestra and was appointed the Principal Cellist of the Bayreuth Festival Youth Orchestra under conductor Peter Gulke. He currently studies with David Soyer at Juilliard School of Music. In June 2007, Mr. Daurov was appointed the Principal Cellist of The Chamber Orchestra of New York under conductor Salvatore Di Vittorio. He recently performed the World Premiere of Behzad Ranjbaran's "Fountains Of Fin" at Bargemusic in New York. In June 2008 Adrian was featured in Gala Concert In Celebration Of Russia's Independence Day at Carnegie Hall among the world-famous soprano Elena Obraztsova and tenor Vladimir Galuzin. Adrian recently performed the World Premiere of "The Epistle" for Cello Solo and Choir by a Siberian Composer Yuri Yukechev with The Russian Chamber Chorus Of New York. Praised by The New York Times as “striking,” American cellist Hiro Matsuo is quickly establishing himself as a rising talent of his generation. His performing career has taken him all over the world, and he has appeared in the most celebrated venues including Alice Tully Hall, Avery Fisher Hall, Carnegie Hall, Jordan Hall, Kimmel Center, Royal Albert Hall, and Seoul Arts Center. An avid chamber musician, Hiro has collaborated with distinguished artists such as Joshua Bell, David Aaron Carpenter, Roberto Díaz, Christoph Eschenbach, Ida Kavafian, Yo-Yo Ma, Anne-Marie McDermott, and Joseph Silverstein, among others. He has made appearances at summer music festivals of Kirishima, Lake George, Music@Menlo, Ravinia, and Salomé at The Hamptons. He performs regulary in the Chamber Players International concert series in New York City. He is an artist of the Metropolis Ensemble and Salomé Chamber Orchestra, and a regular guest of Sejong Soloists and Solisti Ensemble. Hiro has earned wide recognition winning numerous competitions and awards from an early age including first prizes in Kishwaukee, Musichorale, Music Teachers National Association, National Foundation for Advancement in the Arts, Society of American Musicians, and University of Illinois Cello Festival competitions, among others. As an orchestral musician, Hiro has served as principal for many concerts. He has played under the baton of renowned conductors John Adams, Charles Dutoit, Christoph Eschenbach, Alan Gilbert, Nicolas McGegan, Matthias Pintscher, Esa-Pekka Salonen, Yannick Nézet-Séguin, Simon Rattle, and Michael Tilson Thomas. Hiro also enjoys collaborating with musicians outside the classical music genre. In 2011, he recorded for The Roots eleventh studio album “Undun.” To celebrate the release of the album, he appeared with the legendary band on NBC’s Late Night with Jimmy Fallon. He has shared the stage with famed artists Keren Ann, Natasha Bedingfield, John Legend, Rufus Wainwright, Florene Welch, and Michelle Williams. He holds a bachelor’s degree from Curtis Institute of Music and a master’s degree from The Juilliard School. He has worked extensively with Gilda Barston, Carter Brey, Timothy Eddy, Hans Jørgen Jensen, David Soyer, and Peter Wiley. Eru Matsumoto, a 20-year-old Japanese cellist, has been charming audiences around the world since the age of 6. Eru is already an experienced soloist, traveling for performances in Vienna, Tokyo, Singapore, Aspen, Los Angeles, and New York City. She made her live on-air debut at age 15, playing the Tchaikovsky Pezzo Capriccioso from the Albany Public Radio Station; at age 17, her rendition of the sonata for solo cello by George Crumb was played on 1320 Warl Talk Radio. She has also performed in a Japanese television commercial, been filmed for a HBO project at the age of 12, and appeared on television with a famous Japanese pop star. As an avid chamber musician and principal cellist with several orchestras, including the Juilliard School orchestra, Eru has performed in such celebrated venues as Walt Disney Concert Hall, Avery Fisher Hall, Lincoln Center and Carnegie Hall. When she was 14 years old, she performed the U.S. premier of Eric Tanguy's sonata for violin and cello, which the illustrious composer himself attended from France. She has been a featured performer in many concerts at the Aspen Music Festival since she was 13 years old, and she was recently well-received as part of the “Juilliard in Aiken” Festival in South Carolina, giving performances and outreach classes every day to standing ovations. By age 16, Eru had been accepted to the Julliard School under the tutelage of the late David Soyer, the legendary cellist from the Guarneri string quartet. She is continuing her studies at Juilliard with Bonnie Hampton. Before coming to the Juilliard School, she studied with the former LA Philharmonic principal cellist, Andrew Shulman and the University of Cincinnati College-Conservatory of Music professor, Yehuda Hanani, and she received numerous awards and honors while their student. She has also taken many master classes with world-renowned teachers including Arto Noras. She is currently involved in multiple recording projects, which are already planning CD release concert tours. 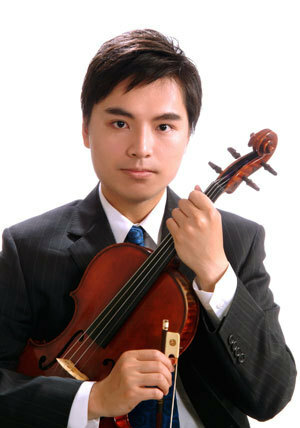 Wei-Yang Andy Lin, recognized as one of the most promising young violists of today, born in Taiwan, is currently a Doctoral Candidate at the Stony Brook University of New York studying with Daniel Panner. He came to the U.S. in 1997 to attend Idyllwild Arts Academy and studied with Donald McInnes. He holds his Bachelor and Master's Degree from The Juilliard School. Mr. Lin has won numerous competitions including the Tainan County and City competitions, Kao-Hsiung City Gun-Du-Bae Competition, Taiwanese National Viola Competition, the Idyllwild Concerto Competition, Top Prize in the 2008 Juilliard Viola Concerto Competition and subsequently made his Avery Fisher Hall solo debut with the Juilliard Orchestra under Maestro Stefan Sanderling playing Penderecki Viola Concerto. Mr. Lin is also the winner of 2009 Stony Brook University Concerto Competition and performed the Walton Viola Concerto with Stony Brook Symphony Orchestra. Mr. Lin is a member of the award winning string quartet The Amphion String Quartet where they have won the Frist Prize in the Piano and Strings Category as well as the Audience Choice Award at the 2010 Plowman Competition. In the same year, they also won the First Prize in the 2010 Kauder String Quartet Competition. Mr. Lin has been a member of the LDX String Quartet, appearing on NPR's "From the Top" radio broadcast; Kafka Piano Quintet, appearing at New York's Taiwan Center and New Chinese Television, and currently is with the Asiana Virtuosi, where they frequently perform in Pennsylvania and has appeared on the Columbia Radio Broadcast "Sound of China". He has served as a principle violist in the Idyllwild Arts Chamber Orchestra, Ureuk Symphony, the Juilliard Orchestra, and the Stony Brook Symphony Orchestra. He has also served as a principle in the International Sejong Soloists, which he was invited to be an artist at the Great Mountain Music Festival and School in Korea. He is currently principle violist of the Carnegie Ensemble and the New York Classical Players. He also had the privilege to perform for the President of the United States, Bill Clinton and the President of Taiwan, Ten-Hui Lee. He has been invited to play and perform chamber music with Itzhak Perlman at Manhattan Synagogue, Princeton University, Jazz at Lincoln Center, and The Metropolitan Museum. Artists he has collaborated with include Itzhak Perlman, Ani Kavafian, Ettore Causa, Carter Brey, Chee-Yun Kim, Jian Wang, Colin Carr, members of the Juilliard String Quartet, the Emerson String Quartet, and the Mendelssohn String Quartet. He has performed throughout the world. Venues in New York include Avery Fisher Hall, Alice Tully Hall and Peter Jay Sharp Theater in Lincoln Center, Carnegie Hall, Jazz at Lincoln Center, Roger Theater of the Metropolitan Museum, and Merkin Hall. He has also performed in Kennedy Center in Washington, Whitaker Center in Harrisburg Pennsylvania, Los Angeles Music Center, and Tainan Cultural Center in Taiwan. He has toured Korea with the International Sejong Soloists and Japan with the New York Asian Symphony Orchestra. Mr. Lin has also served as a faculty at Musica e Arte in Tolentino, Italy and is currently the artistic director of the New York Formosa Choir. He has been a part of several Music Festivals which include Bowdoin Summer Festival, Aspen Summer Music Festival, Music Academy of the West in Santa Barbara, Music@Menlo, and The Perlman Chamber Music Workshop. Throughout his musical study, he has studied chamber music with Earl Carlyss, Warren Jones, Cathleen Winkler, Timothy Eddy, Jerome Lowenthal, Joel Sachs, Ian Swanson, Joel Swanson, Itzhak Perlman, Donald Weilerstein, Merry Peckham, Andre Emelianoff, Seymour Lipkin, the Juilliard String Quartet, the Guarneri String Quartet, the Mendelssohn String Quartet and the Emerson String Quartet. He has studied solo with Donald McInnes, Roger Myers, Victoria Chang, John Graham, Michael Tree, Toby Appel, Hsin-Yun Huang, Katherine Murdock and Lawrence Dutton, currently with Daniel Panner at the Stony Brook University of New York.